Glad to see you back today. Thursday is full of fun. First we have the Inspirational Challenge. You're going to be inspired by Pop Corn. Click on the word Thursday above this post to go to the challenge. Next we have the scrapbook challenge. This page was done by Amy. At the top of the page you will see the words Scrapbook challenge, they will take you to the challenge. Thursday is also the day we learn to be thrifty. 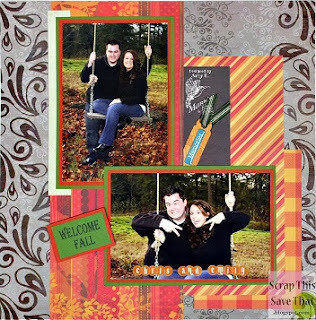 Click on the words Stampers Columns at the top of the page and see what The Thrifty Stamper has in store for us today.